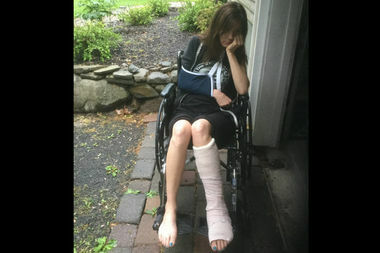 Heidi Karelson is convalescing at her mother's house in upstate New York after getting by a cyclist leaving her with a broken foot, a broken collarbone, a hematoma on her head and fractured skull. GREENPOINT — The waitress of a gourmet pizza joint is facing at least $25,000 in debt from medical bills and lost wages after a runaway cyclist blew through a red light, slamming into her and fracturing her skull, collarbone and foot, she said. Heidi Karlsen, 43, who expects to be out of work for eight weeks because of the collision, is nursing her injuries and a growing anger over the lack of accountability over the May 10 crash at the corner of Manhattan Avenue and India Street. Cyclist Aineel Rolle, 24, admitted in the police report that he was unable to stop at the traffic signal and mowed down the Paulie Gee's server, but he was not arrested and not issued a summons after the accident. "There's just no accountability," Karlsen said. "In the case of [cyclists], they can just [ride] around, knocking anyone into the street and never have to pay a dime. He just goes on his merry way, riding around." Karlsen, whose head smacked against the pavement when she hit the ground, has no memory of the collision, which happened about 7:30 p.m., or the fifteen minutes leading up to the crash. What she does know, she pieced together from the police report and information from her doctors at Bellevue Hospital. Karlsen had a day off and remembers she was walking from the gym to her apartment a few blocks away. The next thing she remembers is waking up in the hospital several hours later, she said. Rolle stayed at the scene, according to the police report, and told police he had run the light. An NYPD spokesman said Rolle hadn't been issued a ticket for failure to yield or any other violation because the officers who responded didn't actually witness the crash. The NYPD's Collision Investigation Squad, whose job it would be to prove failure to yield by interviewing witnesses and tracking down video footage, only investigates instances where pedestrians are more seriously injured, the police spokesman said. Karlsen said she left messages with 94th Precinct detectives who investigated the crash, but they haven't returned her calls, she said. Karlsen, who has no health insurance, said she's already facing $10,000 in medical bills that she expects will continue to climb as she receives follow-up care over the next few weeks. The wages she'll lose in the next eight weeks will end up putting her at least $25,000 in debt, she estimated in a crowdfunding campaign to pay her bills. She'd raised more than $4,000 by Wednesday morning, a day after it went live. Karlsen tried to buy into the New York State of Health exchange this fall but she earned too much to get a subsidy and couldn't afford the $400 a month premium and $7,000 deductible she was eligible for. Paulie Gee's, where she's worked for two years, has less than 50 employees and thus doesn't offer health insurance, though they've been supportive of her and helped her figure out how to qualify for short-term disability, she said. Paul Giannone, owner of Paulie Gee's, said Karlsen would be welcome back once she was well. “She’s been a great employee,” he said. Rolle worked at Bicycle Habitat cyclist shop until several months ago, according to an employee there, but no longer works there. He could not be reached for comment. Karlsen said the crash has left her with little recourse. She's out of work, sinking into debt, and been told by lawyers she's consulted that trying to sue a cyclist with limited assets won't be worth it. She said she wants to see police start treating cyclists like drivers — saying that they can inflict damage too, and that they continue to ride aggressively or illegally near where she lives, zooming down on one way streets or nearly knocking into her onto the sidewalk. "They have to start respecting the rules," she said. "It's a law, a bike is a vehicle. I had the right of way."